Whether you’re trying to communicate a vision, sell an idea, or inspire commitment, storytelling is a powerful business tool that can mean the difference between lackluster enthusiasm and a rallying cry. Addressing a wide variety of business challenges, including specific stories to help you overcome twenty-one difficult situations, Lead with a Story gives you theability to engage an audience the way logic and bullet points alone never could. This how-to guidebook shows readers how powerful stories can help define culture and values, engender creativity and innovation, foster collaboration, build relationships, provide coaching and feedback, and lead change. Whether in a speech or a memo, communicated to one person or a thousand, storytelling is an essential skill for today’s leaders. Many highly successful companies use storytelling as a leadership tool. At Nike, all senior executives are designated “corporate storytellers.” 3M banned bullet points years ago and replaced them with a process of writing “strategic narratives.” Procter & Gamble hired Hollywood directors to teach its executives storytelling techniques. Some forward-thinking business schools have even added storytelling courses to their management curriculum. 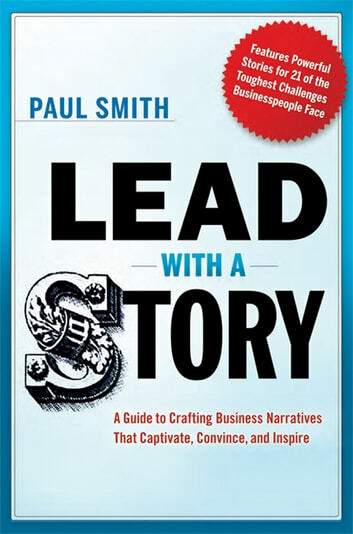 Complete with examples from these and many other high-profile companies, Lead with a Story gives readers the guidance they need to spin a narrative to stunning effect.